IIT JEE Physics: The JEE Advanced (previously known as IIT JEE), is a national-level entrance exam conducted for engineering aspirants seeking admission into Indian Institutes of Technology (IITs) and few other top engineering colleges. Only students selected in JEE Main are eligible for appearing in JEE Advanced. Every year, over 14-15 lakhs students appear for JEE Main and only around 1.5-2 lakhs students are selected to appear for JEE Advanced. To put in another way, there is stiff competition among students who want to get admission in the IITs. In order to crack the IIT JEE, the students need to be well brushed with the syllabus and, particularly, the important chapters. Subjectwise, IIT JEE Physics tends to demand the most attention. 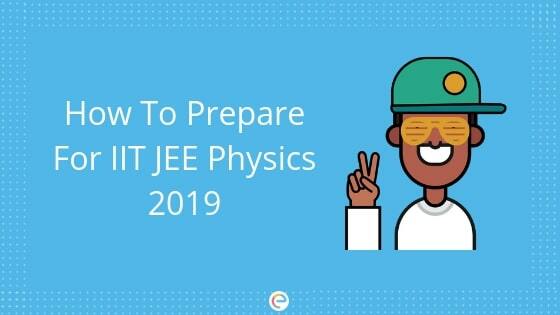 In this post, we shall focus on how to prepare for IIT JEE Physics in the best and score-improving way. Make a timetable and stick to it. After all, half of your preparation would depend on your discipline and your productivity. With this in mind, allocate fixed time for Physics. Go through the NCERT books for Physics. NCERT books cover all the topics in the syllabus of the exam. For this reason, finish the NCERT books first to clear your basics. It is very important to get a clear understanding of the basic concepts. Once your basics are cleared, focus on the most important chapters for IIT JEE Physics. Prioritize your important chapters depending on their weightage in the exams. Make a complete list of derivations, formulas, and experiments in your syllabus and keep that list somewhere you can see it every day. Revise all the important concepts religiously. Solve IIT JEE practice questions regularly. Mark the questions you find difficult to solve and revise them regularly. Once you have finished the entire syllabus, take full-length IIT JEE mock tests. On Embibe, you will get a detailed analysis of where you stand and what your strengths and weaknesses are after each test. In addition, Embibe also allows you to compare your performance with that of top rankers. To sum up, Embibe provides everything that you need to crack IIT JEE. Take your IIT JEE preparation to the next level by preparing on Embibe. Embibe’s RANKUP keeps track of your performance – your attempt data while you take tests on Embibe. Then, it generates personalized practice packs (PPPs) for you. These PPPs contains handpicked questions from chapters and concepts you are weak at. As you practice these questions, you achieve mastery over your weak areas, which means, with each test your score increases. We hope that this information on IIT JEE Physics Preparation helps you. If you have any questions feel free to post it in the comment box below. We will get back to you at the earliest.